When you think “holiday season” what often comes to mind are traditions and memories. 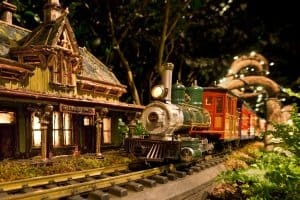 One such tradition for many families in the New York area has been the New York Botanical Garden’s Holiday Train Show , which has delighted visitors for the past 25 years. This year’s edition at the Botanical Gardens in the Bronx promises to continue this beloved tradition by showcasing the iconic skyscrapers and architectural wonders of Midtown Manhattan. 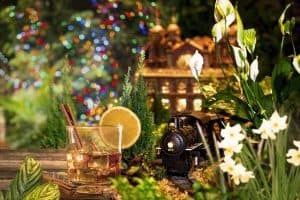 The NYBG’s Holiday Train Show presents its “city in miniature” of over 150 New York buildings and landmarks crafted from plant parts together with an exciting array of more than 25 large, G-scale model trains and trolleys. Many first-time visitors to the show are surprised to see that the chugging trains – always a delight for the kids – actually seem secondary to the amazingly detailed building replicas. 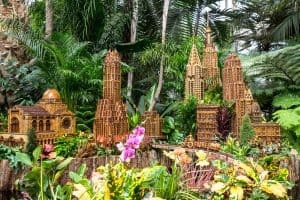 And taking center stage this year, as NYBG showcases Midtown Manhattan, are new renditions of the Empire State Building, the Chrysler Building, the General Electric Building, and St. Bartholomew’s Church. We were truly amazed by the intricate details of these botanical creations. Using a wide variety of natural materials such as bark, twigs, stems, fruit, seeds, pine cones, gourds, and even pepper flakes, artisans from creator Paul Busse’s team at Applied Imagination have skillfully recreated the Art Deco details of the facades, spires, and domes of these iconic structures. Even the famed sunburst crown of the Chrysler Building, the changing internal lighting schemes of the Empire State Building, and the elaborate Art Deco ornamentation depicting lightning bolts on the General Electric Building are depicted with exacting detail. Other visitor favorites include renditions of the Brooklyn Bridge, the Statue of Liberty, Grand Central Terminal, and the original Yankee Stadium. 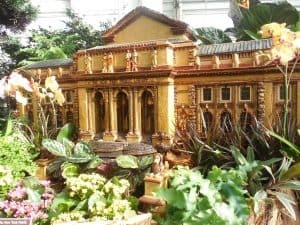 The recreated buildings and structures are artfully integrated with the beautiful flowers and lavish plants of the Botanical Garden’s stunning, glass-domed Conservatory. The replicas represent each of the city’s five boroughs, the Hudson River Valley, as well as other locations in New York State. The model trains and trolleys zip along nearly a half-mile of track traversing overhead trestles, traveling through tunnels, crossing iconic bridges and passing waterfalls that cascade into flowing creeks. Imagine a child’s wide-eyed glee when they see the popular Thomas the Tank Engine in two of the displays. A great time to visit the Holiday Train Show is later in the afternoon. The exhibit’s intricate details can be viewed in the daylight, but the festive lighting and cleverly illuminated buildings intensify the experience once it grows dark. Advanced, timed tickets are a must for this time of day and are strongly suggested for any other times. Botanical Gardens. The extremely popular Bar Car Nights return to the NYBG on select Fridays and Saturdays. Exclusively for adults 21 and over, the evenings include lively outdoor adventures, holiday specialty cocktails, spiked coffee and hot chocolate, and other beverages available from cash bars. An after-dark viewing of the Holiday Train Show is the centerpiece. A fire pit in the Visitor Center invites guests to sit and relax by a warm fire. The Pine Tree Café features the Shake Rattle & Roll Dueling Pianos, with performances that are equal parts concert, comedy, and cabaret, with no tunes off-limits. Snow Globe Dancers, with circus artists and ballet performers, lead Garden visitors arriving via Metro-North Railroad to the Holiday Train Show. Larger-than-life twinkling Snow Queens from Cirque De Light glide among visitors. Excitement awaits children in the Evergreen Express program in the Everett Children’s Adventure Garden. Imagine a child’s delight as they explore plant parts from assorted evergreens, make herbarium pressings of a conifer specimen, and craft a swag to take home. On weekends, children create train puppets and join a musical marching parade. Engine 22 rolls past a replica of Bedford Station in the Bronx. Other holiday events include Holiday A Cappella, a mix of holiday music and alternative music performed by a cappella musicians, including the Columbia University Glee Club, Fordham Satin Dolls, Broadway Carolers, and Barnard Bacchantae. The Holiday Film Festival will present showings of Ice Age: A Mammoth Christmas, Shrek the Halls, and How to Train Your Dragon: Gift of the Night Fury. Children can join Thomas and Driver Sam on a fun-filled, sing-along, mini-performance adventure in All Aboard with Thomas & Friends. You can extend your holiday season because this year’s Holiday Train Show runs through January 15, 2018. 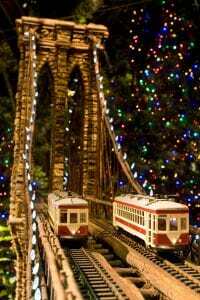 Visit the New York Botanical Garden website for information about all of the programs and for information about the Holiday Train Show’s pricing and hours. ← Brewery Ommegang Means “OMG”!